Straddling the border of England and Wales, Hay-on-Wye (pop. 1,300) is Europe's largest permanent used-book market, with about 60 bookshops selling all kinds of publications imaginable. The village's first second-hand bookshop opened by in 1961. Its owner, Richard Booth, started from the concept that buying books from all over the world will bring customers from all over the world. He was right. Other bookshops quickly followed suit, and in the 1970's Hay had become the world's first Book Town. 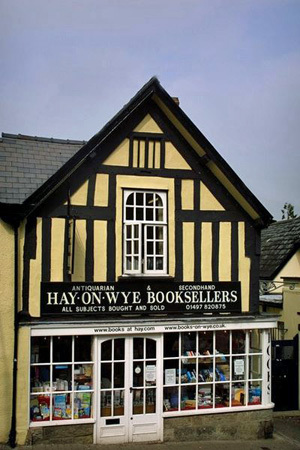 On 1 April 1977, Hay-on-Wye famously declared itself independent from the United Kingdom, with Richard Booth, the first local bookseller and owner of the ruined 900-year old Hay Castle, as its new king. Hay's "king" now sells low-cost "peerages" to perplexed visitors. The Hay Festival of Literature & Arts has been held for 10 days each years since 1988 (late May to early June). It was described by Bill Clinton in 2001 as "The Woodstock of the mind". It now draws some 100,000 visitors during these few days. The event has been sponsored by The Guardian newspaper since 2002. Hay-on-Wye has inspired the creation of copy-cat book towns around world, for instance in the equally tiny Belgian village of Redu, near Luxembourg. Sister short-term festivals have sprung up in Parc Prison in Bridgend (Wales), Belfast, Segovia, Cartagena, the Alhambra Palace in Granada, Beirut, Nairobi, the Maldives, Kerala, and Zacatecas (Mexico). Hay-on-Wye is not properly in Herefordshire, but right across the Welsh border, the River Wye marking the boundary.The English part of town is adminstratively separate, and is called Cusop. The nearest train station is Hereford. From there, bus No 39 or 40 make the connection to Hay (55min, £6.60).